Red Guava exuding a strong, sweet, musky odor when ripe, may be round, ovoid, or pear-shaped. At the center of the fruit is a cluster of small hard seeds about the size of a peppercorn. 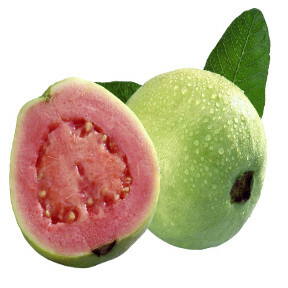 The pulp inside may be sweet or sour, and off-white (“white” guavas) to deep pink (“red” guavas). Handling: In many countries guavas are eaten raw and can be made into juices, milkshakes, ice creams, smoothies and fruit bars. Has shelf life of 7-10 days.